I would like to introduce to you a system and means to convert liquid petroleum fuels into a steady stream of high density dry vapour. The concept that I have employed allows for the continual production of dry vapor fuel that is capable of running an internal combustion engine. It also recycles the un-evaporated waste liquid fuels with an overflow return line that is connected to a fuel pump. Fine droplets of fuel that would have other wise been aspirated through the engine and burnt in a catalytic converter is recycled, cooled, and returned to the fuel tank. One feature of this vaporizer system is that it removes the liquid fuel droplets and mixes dry vapour fuel into the jet stream, which makes it possible for our automobiles to run as clean as a natural gas powered engines. This vaporizer is a system that redirects a portion of the engine heat into the vaporizer unit. It then uses the heat from an internal combustion engine to vaporize liquid gasoline into high-density dry vapor. When the vapour fuel reaches an optimum density, the engine will burn this efficiently as if it would burn natural gas, or propane. This opens the possibility for the dry vapour fuel to be metered, and controlled, and introduced into the engine by similar means as natural gas, or propane powered vehicles. The author has no control of workmanship of others attempting to construct my vaporizers. Therefore, the responsibility of quality and workmanship, and hazards, is on the builder. If you build your own vaporizers different than what I describe in this writings, your results may vary accordingly. Anyone attempting to build any vapour systems such as I described in this writing, must do so with care and caution, and insure safety is front and foremost at all points of construction. effect. I focused mainly on improving my ideas to enhance the vaporization of liquid fuels, and the means to control the flow, and the density, and the mixtures of the air to vapour fuel ratios. The vehicles that I used for the testing of the vaporizers is a GMC crewcab 1 ton truck 4x4 dually with a 454 cid engine, and the other test car is a 1973 FORD Station wagon with a 400 cid engine. 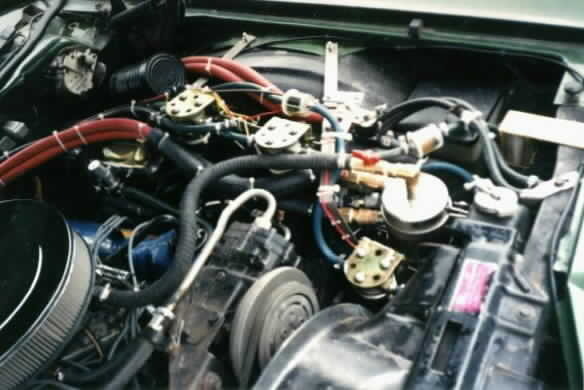 The engines of these vehicles are shown in fig 3 and 4.
a hose connection to an air inlet pipe leading into the gas tank, there is also a one way check valve mounted in between the small air filter and the gas tank, this insures that there is no outward flow of gasoline. This air filter is for the purpose of filtering the in rushing air into the inlet of this fuel vapour system. There is mounted another stainless steel vapour line that is connected to the fuel tank, and runs all the way along the under frame of the vehicle, and goes up to the engine compartment where it enters the bottom of the vaporizer. 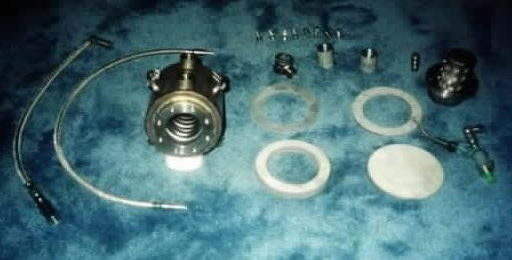 At this point, the vapour is collected and delivered the from the gasoline tank and plumbed into the filtered air inlet on the bottom of the vaporizer. Test has shown that the density of the vapour fuel from the gasoline tank alone, is enough to run a big block 454 cid engine at up to 1500 rpm. The density of this incoming vapouur charged is greatly multiplied when the incoming vapour charge bubbles through the pool of liquid gas that maintained inside the bottom of the vaporizer. Check (Filtered Air Inlet) in the diagram I provided. I constructed this vaporizer system to work as a heat exchanger that redirects and delivers heat from the engine to the vaporizer, and back to the engine again. The heat is then transferred to heat the liquid fuel that is pumped through the cold start injector nozzle, the heated liquid fuel is then inside the isolated fuel vapour chamber. The heated dry vapour fuel is then continually drawn up and through a multi layered screen stack, and out of the top of the vaporizer with the use of the engine manifold vacuum pressure. The screen process filters the liquid gasoline droplets that are floating around inside of the vapour chamber, and collects it at the bottom of the vaporizer as the dry vapour fuel is delivered to the engine. Now we have an isolated inner vapour chamber that is heated from the engine. The gasoline that is sprayed out of the injector nozzle is mixed with the vapour fuel that has been pumped from the gas tank. The fuel is then vaporized into a very heavy vapour density inside the upper portions of the vaporizer. The heavy vapour fuel density under manifold vacuum is drawn up through multi layers of 100 mesh stainless steel screens, and wool. This multi layered screen system effectively removes all fine liquid droplets that are floating around inside the vapour chamber, it also functions as an effective safety flame arrestor as shown in upper right of fig 1. A ventury plate (to create the vacuum) is mounted on and with the air intake system, this is where the dry heavy vapour fuel density is drawn in (or pushed) and metered, and is mixed with the in rushing air, shown in fig 6, 7. The engine then burns this high density vapour fuel as if it were propane or natural gas. Many components from propane powered vehicles can be adapted and used in many areas of my vapour system. Such as all the gas lines, vapour lines, hose connections, ventury, O2 sensors and controllers to automatically control the vapour fuel to air ratios. This vapour system will run lean if the inlet valves are closed too much, and it will also run very rich mixtures if the inlet valves are open too much. The purpose of the O2 sensor and controller chip is to control the air to vapour fuel mixtures. The O2 controller unit that works with a fast reacting dry vapour valve, cuts back some of the vapour fuel so it will not run to rich. And when the O2 censor controller unit senses a lean mixture, it opens the fast acting vapor inlet valve to allow more vapour to flow in the mixture, thus keeping the air fuel ratios as optimum as possible. 1) Small air filter, one with a 1" inside diameter and approx. 3" high. 2) 1/8" 304 stainless steel plate, 20"by 20" square, non-corrosive. 3) One each, 100 and 200-mesh stainless steel screen 20" by 20" square, non-corrosive type. 4) Two 7-psi minimum electric fuel pumps for the injector nozzle. 9) 10" by 10" square, 1/2" thick stainless steel plate. 10) 6" long, 1 5/8" diameter stainless pipe, wall thickness 1/8" or less. 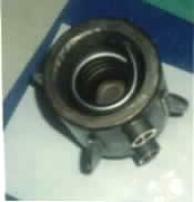 11) Electronic feed back control dry vapor valve with O2 sensor, (# note this is optional). 12) Propane vapor hose or stainless steel line, 1" diameter, enough to reach from gas tank to engine compartment. 13) 12 volt, 3 terminal solenoid, and two 15 amp toggle switches. 14) Spools of electric wire #14 gauge, black, red, green, yellow. 15) Silicone pipe sealant, or tape pipe sealant, to prevent leaks in the threaded connections. 16) Machine fasteners, 1/4" thread, 1/2" thread length, box of 30. 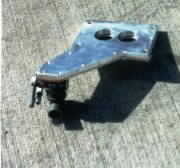 17) 1/2" long machine fasteners, 1/8" thread or a little larger, longer fastener can be cut. 20) 1/2" diameter stainless tubing (# note -not pipe) for hot coolant version, 30" long. 21) 3/4" diameter stainless tubing (# note - not pipe) for hot exhaust version, 30" long. 23) 25" long stainless tubing (# note - not pipe), approx. minimum 3/4" inside diameter. 24) 25" long stainless tubing (# note - not pipe), 11/2" diameter. 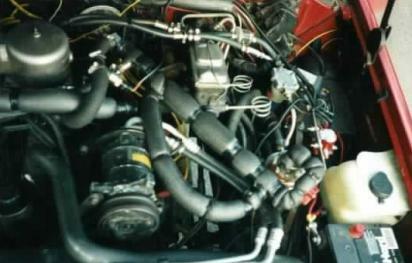 28) 10' heater hose, if hot rad coolant option us used. 29) Several sizes of stainless steel clamps, 16 total (no weaker steel ones). 30) Several flat rolled iron bars, 3/4" wide & 1/8" thick, for mounting of vaporizer, etc. 31) Nuts & bolts, 1/4" thread, several sizes less than 1" long with washers & lock washers. 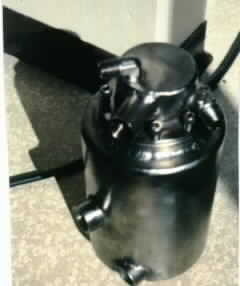 during assembly of vaporizer in fig 8. after completion of tig welding in fig 9. When I was testing the operation of the vaporizer in cold weather, I noticed a decrease in the density of the vapour that was getting to the engine. I found that due to the cooler air temperatures the vapour would tend to change phase back to a liquid, which caused the density of the vapour to drop. 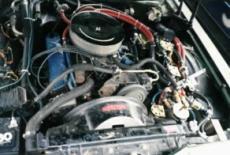 While running the Ford 400cid motor in cooler temperatures, and using propane vapour hose to deliver the dry vapour fuel from the vaporizer to the engine, the problem was more noticeable. See fig 5. I solved this problem by shaping stainless steel pipes that are mounted within pipes, the ends are then tig welded with stainless threaded pipe connections, shown in fig 12. 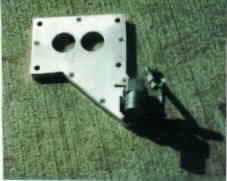 This made for a longer heat exchanger unit with two isolated chambers, one inner and outer. 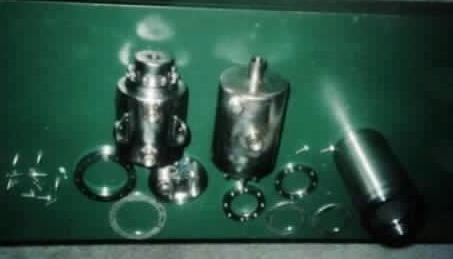 Hot fluid medium from the engine is circulated through the outer chamber, similar to heating of the vaporizer. 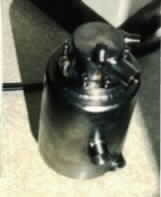 The cooling vapour problem was solved using this heat exchanger pipe which prevented the vapour from cooling, and allowed the vaporizer to perform better in cooler weather. My testing have shown that in order for the system to run with greater efficiency, the temperature of the heated vapour must be maintained on route to the air intake system as soon as the vapour fuel is produced, fig 12. Looking at the many possibilities of a vapour system like this and being creative, the technology can be optimized to realize its full potential as a viable option to increasing the fuel economy, and cleaning up the emissions of our automobiles. Then we could all drive a more efficient and cleaner running automobile, achieving improved fuel economy and reducing pollution is easier than one thinks. This system when perfected can help us reach that goal and reduce our dependency on fossil fuels. During the testing of my earlier vaporizers, I have found that the density of the vapour gas in the system can become unstable with changing outside temperatures and varying engine rpm. This stresses the importance to design the vaporizer to produce a consistent high-density dry vapour fuel on engine demand. I added improvements to aid the systems performance, some of which have been addressed in this writing, and others have not. The vaporizer system I am describing will allow you to continue the development where I left off, which you can make your own improvements to improve this system even more. 1) A/F ratio - This is the fuel air ratio mixture, 14 to 15 is our target. We have achieved this percentage which is adjustable through the mixing ventury. 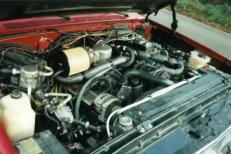 The air to vapour fuel mixture ratios can be changed by adjusting the opening and closing of the mixing valves. 2) HC - Hydrocarbon blow by pollutants (toxic gasses). The lowest possible reading was our project goal. 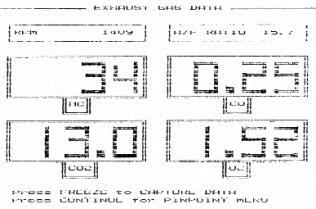 We have achieved a lower reading of 22 using vapour fuel fig 14, and a higher reading of 45 using propane fuel fig 15. Both readings are under Canadian accepted levels of around 60. 3) CO - Carbon monoxide gas. 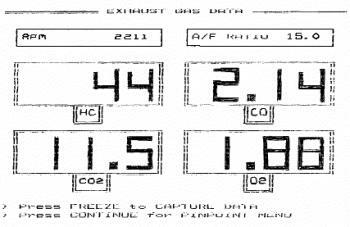 The lowest possible reading is our goal, and we have achieved 1.27 in the vapour fuel test. 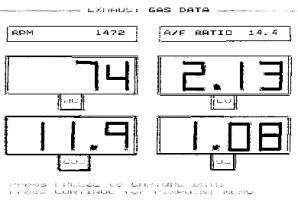 This is an improvement compared to the results of propane gas, which gave a reading of 2.41. This also shows a drastic drop in carbon monoxide gas, which results in more efficient burning of the fuel, with less waste, and less pollution. 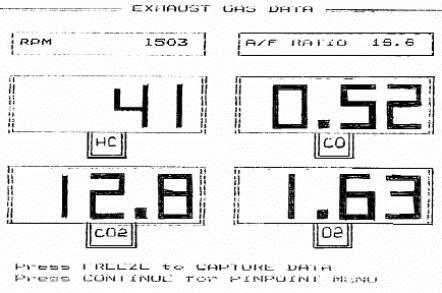 4) CO2 - This indicates percent of fuel burnt, an efficient running engine should read below 14, our results were well below that with a reading of 12.6 for gasoline vapour, and 11.8 with propane fuel. 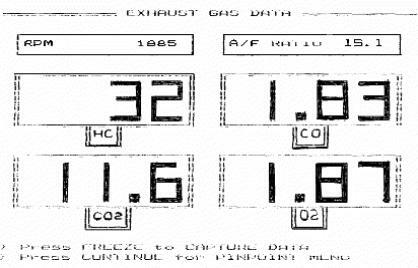 Of the many other print outs of the test results, the vapour system gave consistence readings that fell within these numbers when the system was running properly. 5) O2 - Oxygen in exhaust. 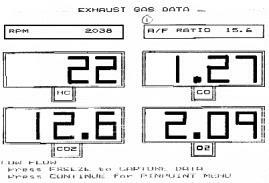 Test show higher oxygen readings in the exhaust system indicate less oxygen consumed during combustion. This shows the dry vapour fuel is burned off during combustion first before the oxygen is consumed, thus higher O2 in the exhaust gas. This reduces the need for an air pump and the catalytic converter, because there is no unburned fuel left in the exhaust system to burn in a catalytic converter. The vaporizer effectively removes the unburnable liquid droplets of gas before the vapour fuel is delivered to the engine. 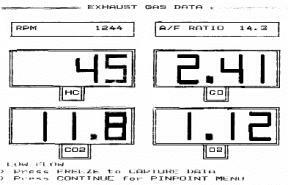 Other air care printed data results are included below from the vaporizer installment on the Ford stationwagon with the 400cid engine. Some of this data show what happens when the vapour system runs leaner, and they are included for comparisons in fig 18, 19, 20. This author is aware that gasoline is composed of approximately 27 difference chemicals and they all vaporize at different temperatures. The vapour system I describe in this writing will tend to circulate the heavier un-evaporated fuels back into the gas tank. If the temperature of the vaporizer were increased to around 450 degrees to vaporize the heavier liquid fuels, less un-evaporated overflow gasoline would circulate back to the fuel tank. This vaporizer is capable of operating at these higher temperatures with modifications to the exhaust system. This arrangement could lead to the elimination of the fuel return line, by pumping only the amount of fuel that the vaporizer needs to produce the desired amount of dry vapour density, on engine demand. The efficiencies that one could expect on their vehicles with this system fuel is still an open question. The more you refine this design to recover the waste un-burnt fuels, the better the economy you will get from the engine. The results from my tests of this vapour system have proven the concept is worthy of further research and development. I hope the reader will take on where I left off with this vaporizer system, add you own improvements to make it better, and carry it further to practical applications for the benefit of society. There is enough information in this writing for you to build your own vaporizer system. I must stress the point again to implement as many safety features as possible when dealing with these gas vapour converters, or any other gas vapour converter. Gasoline vapor is explosive and must be treated with respect and care, and never let your guard down. I wish you all the success, and good luck in developing your own vaporizer system, the possibilities are unlimited. At this time, I would like to express my thanks to all those who have been supportive, and helpful in our efforts to making this vapour system possible, without your help we may have not been able to continue. I would also like to thank my good friends Brian and Rose Langan, with out their help it would have taken us much longer to develop the vapour system. In particular, I would like to thank my wife Janice for all her years of dedication, understanding, and support, in our quest to realize the dream of a better future.